This house was built c. 1915 for Dr. York Bailey, St. Helena Island’s first African American doctor and its only physician for more than 50 years. 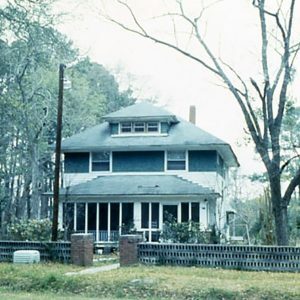 Bailey ordered the parts for the house from a mail-order catalog and they were shipped to Beaufort, then brought across to the island by boat. The house is a good example of the vernacular American Foursquare house form. Bailey, born on St. Helena in 1881, graduated from Penn School and Hampton Institute and studied medicine at Howard University. He returned to the island in 1906 to practice medicine.